"I wish that global safe and secure infrastructure, which is combined with cellular phone networks, could be established by cooperation with governments and enterprises in Asia." Dr. Hiroshi Nagai, the Vice President of SKY Perfect JSAT, talks about the future satellite communication services. "A Happy New Year! 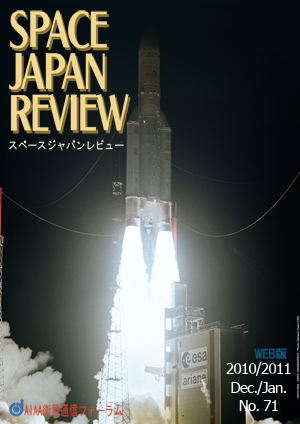 The year of 2011 has come and Japan's new defense plan was established in the end of last year and it describes the space development and its utilization under the Space Basic Law. ... "
"Positioning accuracy with GPS may not be sufficient for high-speed mobile users such as trains or cars. These difficulties require the development of new satellite positioning technology. QZSS (Quasi-Zenith Satellite System) is considered to be a possible candidate to solve these difficulties." The first Quasi-Zenith Satellite was launched in September 11, 2010. ENRI has started an experimental project to study highly accurate positioning technologies with an L1-SAIF (sub-meter class augmentation with integrity function) signal developed based on SBAS standard. The target of user position accuracy is set to one meter rms. This article will introduce the ENRI experimental system and recent results. "It was one of my dreams from school days for me to concern a series of flow, from developing a satellite to advancing towards experiments. I would like to introduce the tracks that I have been realizing my dream and a further target in the future." "I liked the sky from an early age. I had so much fun imagining the end of the sky world. Of the sky, enchanted existence of the universe, and so far I have decided the way for future. Now with setback and expectation mixed, and look forward to the unknown future. . .
Alex Abella, Soldiers of Reason: The RAND Corporation and the Rise of the American Empire, Houghton Mifflin, Harcourt, 2008. "I know the name of "RAND" as a research institute about national security, but thought to the degree whether it is one of research institutes affiliated to the Massachusetts Institute of Technology. However, this was wrong belief. This book is translated into Japanese in 2008. Then I will introduce contents of this book briefly below." Dr. Akio Iso talks about satellite communication services that have been provided before and behind disasters occurred in Japan. .
Japan - Korea Joint Conference on Satellite Communication (JC - SAT) was held on 28 and 29 October 2010 in Gyeongju City, South Korea. This conference targets the exchange of information and mutual understandings between researchers of satellite communications fields in Japan and Korea, and IEICE Technical Committee on Satellite Communications of Japan and Korea's Korean Society of Space Technology (KOSST) have co-organized the conference annually since 2000. From 24 to 28 October 2010, one of meetings for space agencies, the Consultative Committee for Space Data Systems (CCSDS) was held in London. Since I attended a workshop of Optical Coding and Modulation (OCM), the discussion on space optical communications is reported. This paper reports WINDS workshop, which was held on 2 December, 2010, in NICT with a theme of "WINDS and the Future Satellite Communications". The 17th Session of the Asia Pacific Regional Space Agency Forum (APRSAF-17), which was held in Melbourne, Australia from 23rd November to 26th November, 2010, will be reported. Question: "I heard that space trash was a problem, but what kind of problem is it?" This will answer questions for space and satellite in plain words.